Marianne Vitale (b. 1973, East Rockaway, N.Y.) works across various medias; drawing, sculpture, video and performance. Her art is versatile, often large-scale and ambitious, playing with intonations of humor and aggression in equal measure. Part of the collaborative performance piece Invasionistas (2006) with artists David Adamo, Agathe Snow, Rita Ackerman, and Michael Portnoy in which they “invaded” Reykjavik, Iceland; Vitale was in charge of propaganda, reading an original World War II evacuation plan as she and Portnoy evacuated a group of kindergarten students out of the city. Throughout her work, Vitale uses her art as an inquiry into the fundamentals of society. Recently, the artist has been exploring the American rural landscape by recreating covered bridges throughout the country in her Long Island City studio, then burning them. In the New York art circuit, Vitale is famed for the wild dinners she hosted, among others in conjunction with the Chop Shop, an artist-run pop-up restaurant. 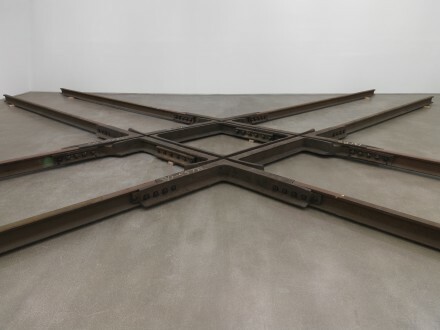 Zach Feuer Gallery is known for representing artists that push boundaries and the gallery has frequently taken risks with young artists (that often prove to become successful, including Swedish artist Nathalie Djurberg). In Vitale’s previous show at the gallery, visitors were met by rustic, torched constructions built out of reclaimed lumber. Diamond Crossings will be Vitale’s fourth show, and second solo show with the gallery, as she continues her exploration of rural America. 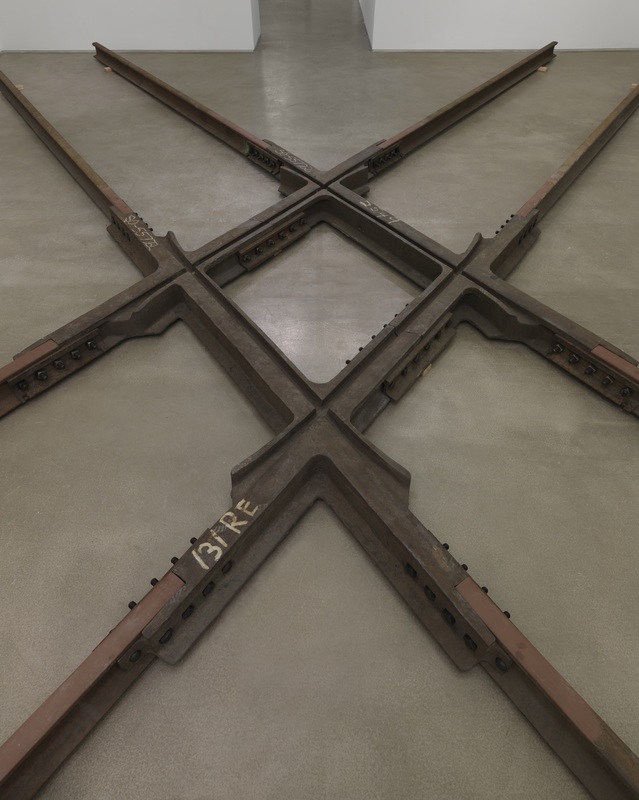 In this show, Vitale embraces the images of the Wild West by creating a junction out of decommissioned manganese railroad tracks, which the visitor is invited to walk through. 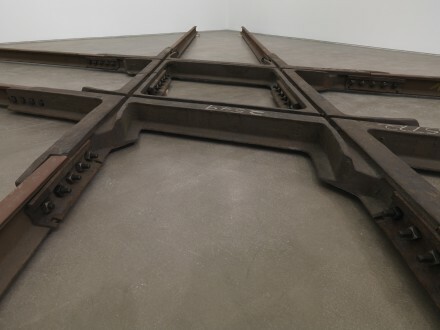 The contrast between the stark white walls and the charred railroad tracks are reminiscent of great minimalist works by artists such as Donald Judd and Frank Stella. 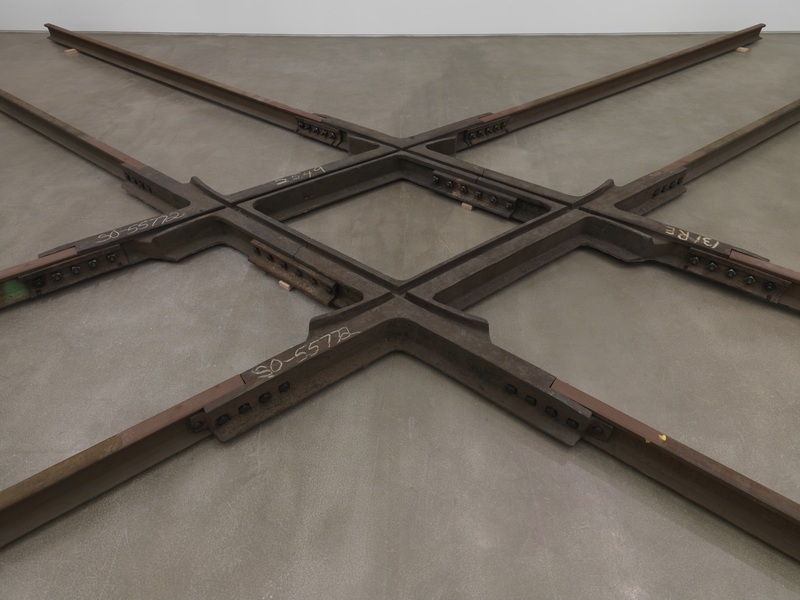 Not only a reflection on the history of art, the piece also evokes the shift from agrarian society to industrialization. Within the context of a white-wall Chelsea gallery, the experience is both monumental and contemplative. The exhibition could not be held at a better time, as Vitale is having a busy spring. During Frieze Art New York, she was invited to contribute to curator Cecilia Alemani’s Frieze Projects section, and was recently commissioned by Performa to create a piece for their fifth landmark biennial, held in New York this upcoming November. The piece she created for Frieze was an extract from an old tobacco barn in upstate New York, a compilation of sorts made from different structural elements. Ibid also exhibited some of her smaller work in Miami this past December: small phantasmal sculptures, titled Douche Bag #…, and created in harshly brushed metal. 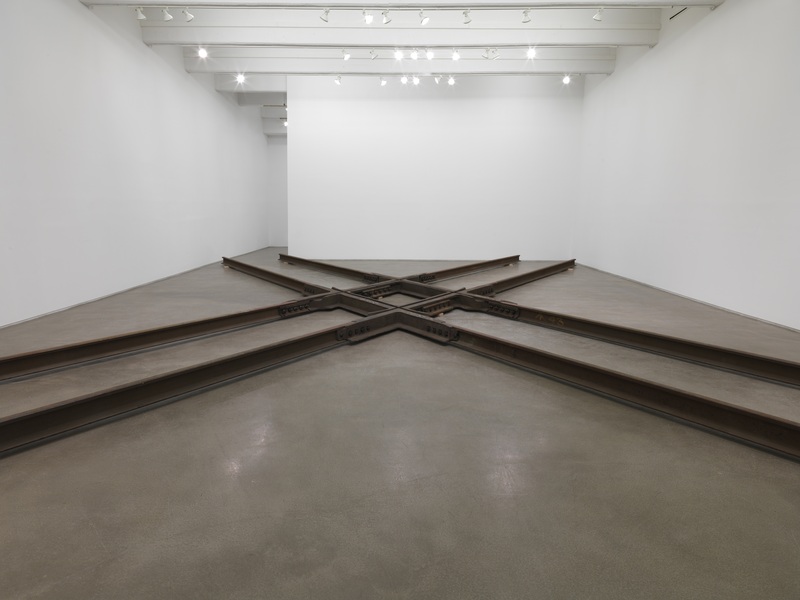 The exhibition at Zach Feuer is open until June 15, welcoming visitors into an eerie space that stands in stark opposition to many of the surrounding Chelsea galleries, offering an art experience that wil blur the boundaries between the cerebral and physical. This entry was posted on Monday, May 27th, 2013 at 12:05 am	and is filed under Art News. You can follow any responses to this entry through the RSS 2.0 feed. You can leave a response, or trackback from your own site.